Know what it’s supposed to do. Change one thing at a time, for a reason. Keep track of what we’ve done. And remember, a week of hard work can sometimes save you an hour of thought. It does this because there are now two variables in play called temp: the parameter to fahr_to_celsius, and the parameter to fahr_to_kelvin. Having two variables with the same name in the same part of the program would be ambiguous, so Python (and every other modern programming language) creates a new stack frame for each function call to keep that function’s variables separate from those defined by other functions. We don’t expect diff to have the value 20.0 after this function call, so the name diff cannot refer to the same thing inside span as it does in the main body of our program. And yes, we could probably choose a different name than diff in our main program in this case, but we don’t want to have to read every line of NumPy to see what variable names its functions use before calling any of those functions, just in case they change the values of our variables. The big idea here is encapsulation, and it’s the key to writing correct, comprehensible programs. A function’s job is to turn several operations into one so that we can think about a single function call instead of a dozen or a hundred statements each time we want to do something. That only works if functions don’t interfere with each other; if they do, we have to pay attention to the details once again, which quickly overloads our short-term memory. Unlike the import statements we have seen earlier, this one doesn’t load the entire ipythonblocks library. Instead, it just loads ImageGrid from that library, since that’s the only thing we need (for now). If a tuple represents an RGB color, its red, green, and blue components can take on values between 0 and 255. The upper bound may seem odd, but it’s the largest number that can be represented in an 8-bit byte (i.e., 28-1). 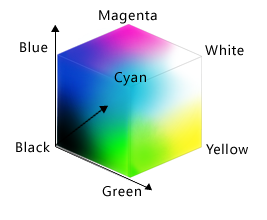 This makes it easy for computers to manipulate colors, while providing fine enough gradations to fool most human eyes, most of the time. Fill in the ____ in the code below to create a bar that changes color from dark blue to black. Why do computers use red, green, and blue as their primary colors? Will changing the nesting of the loops in the code above — i.e., wrapping the Y-axis loop around the X-axis loop — change the final image? Why or why not? Why did we transpose our data outside our heat map function? Why not have the function perform the transpose? Why does the heat map function return the grid rather than displaying it immediately? Do you think this is a good or bad design choice?